The CooKit saves more than four times its value in fuel each year. With careful use and storage, a CooKit can be used for many years, and can reduce firewood consumption by one ton each year. The CooKit reduces respiratory diseases and eye irritation since the cooking process is smokeless. The CooKit has successfully been used in numerous refugee camps, providing meals to thousands of refugees worldwide. Thanks to co-developers Roger Bernard of France, Barbara Kerr and Sherry Cole of the USA, with work also by Ed Pejack, Jay Campbell and Bev Blum of SCI, the CooKit is available as an economical and effective solar cooking device. CooKits have been great ways to introduce people to solar cooking, through Peace Corps volunteers, Girl Scouts, and the Food Bank. Interested in purchasing a CooKit? The CooKit can pasteurize drinking water, making it safe to drink. 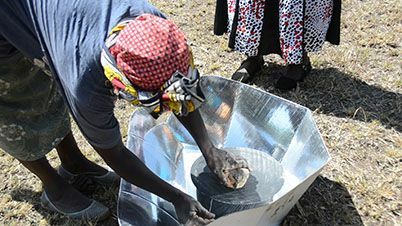 Solar cooks often report that the money they save on cooking fuel purchases is used for many essentials, such as extra food, school supplies, and medical care. Building and selling CooKits provides micro-enterprise opportunities for women and girls. Using CooKits frees up time from collecting firewood and dung and tending fires, so women can do other business work and children can attend school. The CooKit is lightweight, collapsible, and easy to transport, making it the perfect cooking device for camping and backpacking.